Martin Williams (Northern Gen) from Sheffield won his first ever festival against 71 other anglers competing in the new DAIWA Match Winner Virgins Festival. Martin a Transport Administrator for Fletchers Bakeries walks away with £1000.00 in cash and the Daiwa Match Winner 811 pole worth £1250.00 plus an invite to the 2003 Parkdean Masters. Martin’s week’s winnings amount to £1469.00 cash and the pole a job well done! Martin had a good start to the festival winning his lake on day 1. Martin fished 11metre pole with pellet on peg 6 Manaccan weighing in 38lb 7oz this put him in 3rd place overall. Andy Gurd fished peg 22 Trelawney the eleven-meter pole cupping 20, 4mm pellet and fishing a 6mm expander on the hook and weighed 51lb 8oz of all Carp to 4lb. Second was Jamie Jones from peg 19 Carleon with 44lb 9oz. Things were hotting up on day 2 with Spencer Smith and Bob Hyde on maximum points. Spencer Smith won Carleon on day 2 fishing a 4×14 rig down the margin with caster catching fishing for Roach but ending up catching carp. His take it easy approach worked on the day and he weighed in 29lb 02oz for his second section win in two days. Bob Hyde won his lake from 28 on Trelawney with an impressive 41lb 08oz of carp and skimmers on the pellet. Martin fished 16 meter pole with corn but was 6lb short of a lake win, this put him third overall in the festival. Day 3 and Spencer Smith took top honors yet again winning his lake and section from peg 2 on Trelawney. Spencer fished long pole shallow and deep and the margins catching Carp, Skimmers and roach to weigh 33lb 12oz.This gives Spencer a perfect three section wins on the bounce with 27 points. Martin also won his lake and section on Carleon with 39lb from peg 13. Martin fished 16 Meter pole with corn and is on 26 points only dropping one point making him second overall. Third overall is White Acres regular Steve Bass winning his section on Lamorna with 37lb 09oz of mainly small Carp on the feeder and pole, this gave him 25 points. Day 4 and with the final shoot out looking exciting four points covered the top five anglers and it was all to fish for. Spencer Smith drew peg 11 Manaccan an average peg but Spencer right on form was ready for his next win! Martin Williams drew peg 20 Trelawney it’s not been the best but he has plenty of room as it end peg. Both anglers started well both catching from the off. The problem for Spencer is that the lake is 25 meters wide and as soon as you get the fish feeding they back off and you need to chase them around the lake. But he stuck with it and ended up second in his section with 29lb 14oz of all small Carp. As for Martin he plugged away all day pinching the odd fish from three different lines and ending up with 62lb 10oz for a section win and second overall on the lake. Both anglers ended up on the same points but Martin had a large weight advantage beating him by 57lb 05oz giving him the first ever Daiwa Match Winner festival win! The only bad thing to come out of Martins Victory is that he is not a virgin anymore and will have to fish with the big boys next year. Spencer Smith (Pool A.C.) was second overall with 35 points and a weight of 127lb 1oz winning £600 and Daiwa Match Winner 14XP match rod worth £190. Third overall in the festival was Justin Iveson (Happy Days) jumping from 8th place on day three to winning his section and his lake on day four with 31lb 08oz from peg 13 on Carleon taking all small fish. 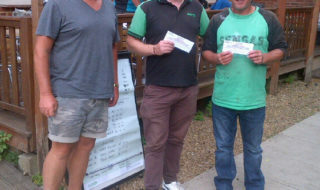 Justin walks away with £400 and a DAIWA Match Winner 13XP match rod worth £180. 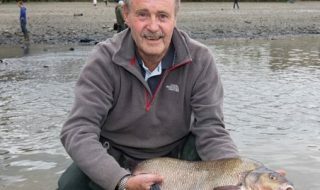 John Tomlinson (Sutton Angling) wins £100 for having the biggest weight of the festival, which was 62lb 14oz on peg 16 on Trelawney day 4. £100 also goes to Michael Buckler for the winning the mystery weight with 68lb 9oz. We must thank DAIWA for supporting this new festival with over £2000 being donated in prizes. We have created a new concept in match fishing festivals and bringing together anglers that don’t normally compete under these conditions and this has been well received. The atmosphere this week has been fantastic and all the anglers have booked to come back next year. 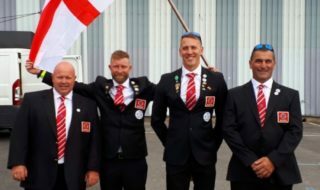 As for festival firsts this has been a good one and paves the way for the first ladies festival at White Acres in July next year. 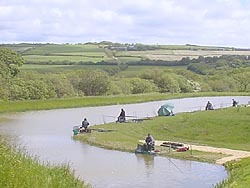 If you are interested in entering the Daiwa Match Winner Festival it will be held on the 5th June 2004 based on 100 anglers fishing. Day Two action from Lamorna. Day Two action from Caerleon. Day two action from Trelawney.